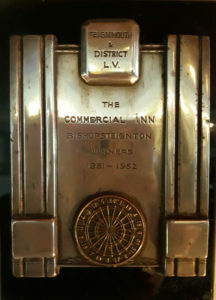 The history of The Old Commercial Inn, Clanage Street, a public house: the building, it's owners, occupiers and sportsmen and women. Various tradesmen have hinted at “Tudor” timbers in the roof. So far, brief investigations for maintenance have identified two previous roof lines, along with traces of thatching material in the loft space. 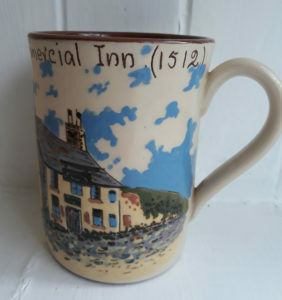 Two of these handmade, traditional Devon pottery mugs have been acquired (one design in series of historic pubs, c.1930s) and now hang over the main bar. 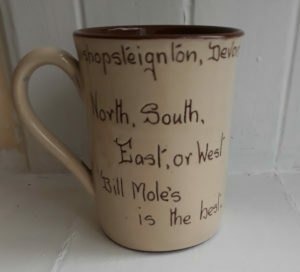 The text on the front reads The Old Commercial Inn (1512) and on the back, Bishopsteignton, Devon – North, South, East or West ‘Bill Mole’s is the best. 1796 The Burial Register records the burial in June of William Hore, Innkeeper. 1815 This inn was apparently called the Old Inn. 1836 The Tithe Map records the property as the Commercial Inn, the owner as John Fulford and the occupier as William Piles and others. This record also lists these occupiers as tenants of a cottage and garden further up Smith Hill on the right hand side (possibly the property now called Mount Radford). John Fulford also owned a homestead and garden at the top of Shute Hill (possibly on the site of what is now the Community Centre). 1838 The Baptism Register records a child of William aged 25 and Sarah aged 30 being baptised. 1841 The Census names William Pile aged 25, Publican and Sarah Pile aged 30, with a 2-year-old William as occupying this house. 1851 This Census names Sarah Pile (widow, aged 46), William (aged 12), John (aged 9) and Sarah Jane (aged 6) as occupying this house. 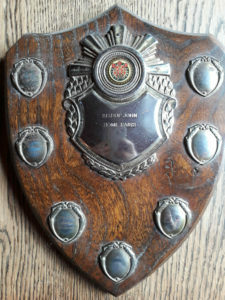 This means William senior will have died between approximately 1944 and 1851. 1856 The Post Office Directory names Mrs Sarah Piles as living at the inn. 1866 Kelly’s Directory names Mrs Sarah Piles as living here. 1870 Morris’ directory names William Boone living here as landlord. This information is repeated over the intervening years. 1891 The Baptismal Register records the baptism of a child of William Henry Boone. 1897 Kelly’s directory names William as being the victualler here. As it does in 1902. 1916 The Burial Register records the burial of William Boone, aged 74. 1919 Kelly’s directory names Mrs William Boone as victualler. 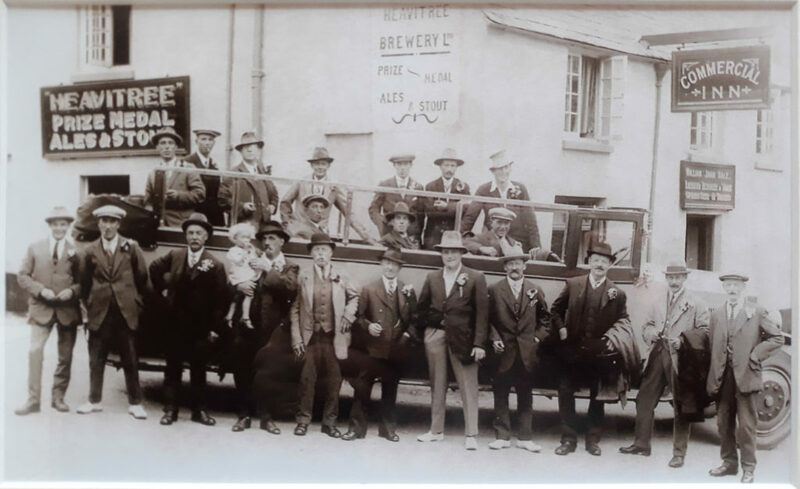 A group charabanc trip outside the Commercial Inn viewed from West Street pictures Bill Mole in the centre (in front row, dark jacket with right hand in trouser pocket) on 13th August 1926. 1935 Kelly’s Directory names William Jn. Mole as victualler. 1939 Kelly’s directory names William John Mole as occupier. 2nd December 1958 Mrs Mary Mole was named as tenant on handover to Mr Cyril Stanley (Mic) Perkins. Mic’s wife Dot retained the tenancy after her husband died and continued to live on the premises when she took on managers to help her run the pub. A lovely memory of Mic and Dot’s time living at The Inn is shared here by Graham Andrews (2012). 10th August 1961, Miss F. H. Goddard to The Heavitree Brewery Limited Conveyance of Part of the Gardens belonging to “Clanage” Bishopsteignton, Devon. 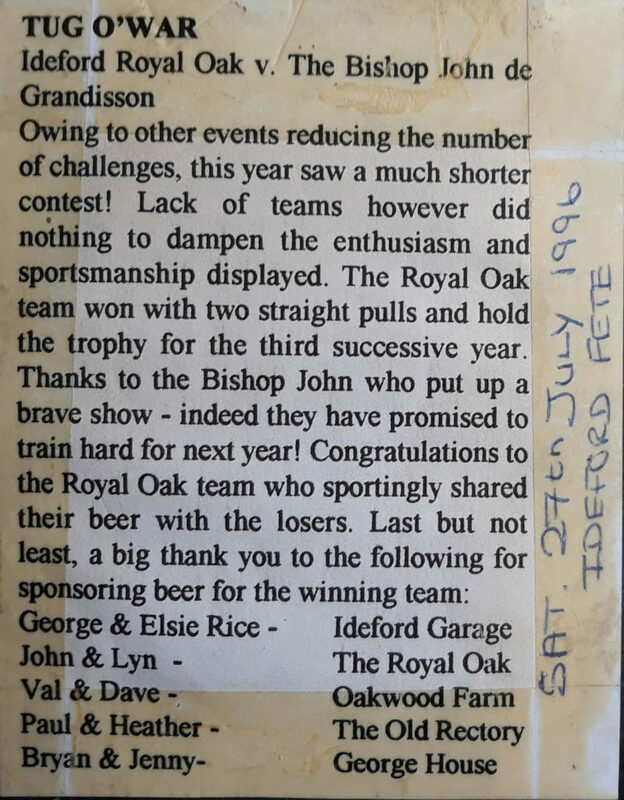 (From the records of Heavitree Brewery.) Land to be used as a car park and beer garden cost the brewery £1000. 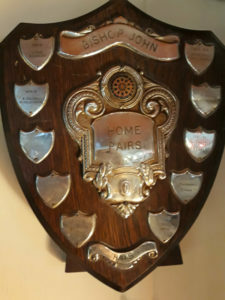 11 March 1968 Renamed Bishop John de Grandisson Inn. 14th October 1994 the tenancy was handed over to Mrs Sue Humphrey. 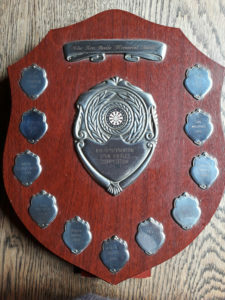 8th April 1997 the tenancy was handed over to Mrs C. M Searle. 11th May 1999 the tenancy was handed over to Mrs T. A. Jackson. 24th May 2000 the tenancy was handed over to Mr M. Dawes. 20th September 2004 the tenancy was handed over to Mr Trevor Abbott. 19th December 2011 the tenancy was handed over to Inn Taverns Ltd.
22nd May 2012 the tenancy was handed over to Mrs K Johnson. 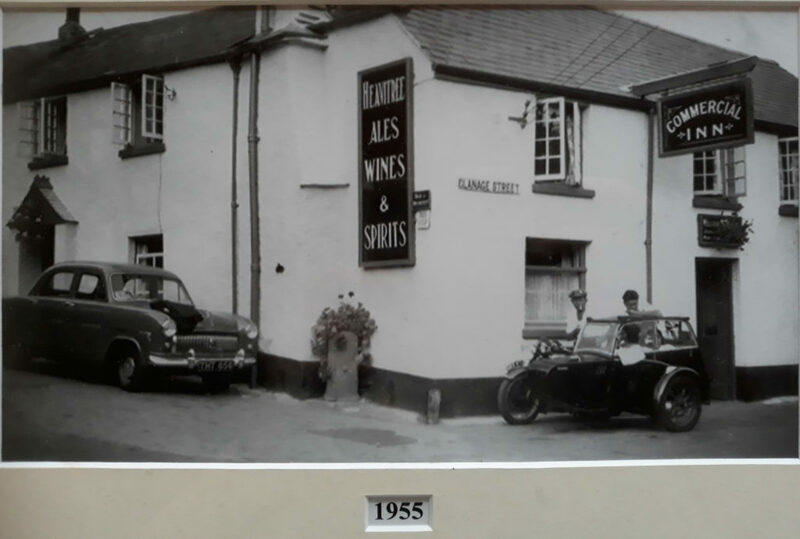 4th October 2013 the freehold to the inn was purchased outright from The Heavitree Brewery Plc by Mr Sidney Thomas Barnes and Mrs Yvonne Barnes. 22nd June 2018 the freehold to the inn was purchased by Mr Michael Smith and Mrs Katharine Smith of Somerset. 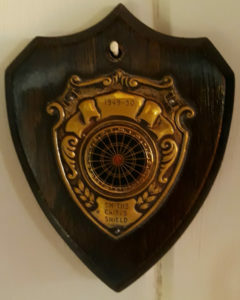 Darts is still a big part of life at the Old Commercial. 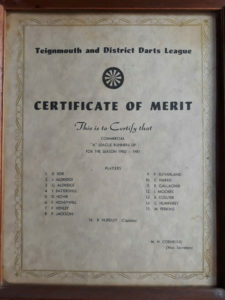 The darts team currently plays in the local Licensed Victuallers Association league and meets weekly for games. 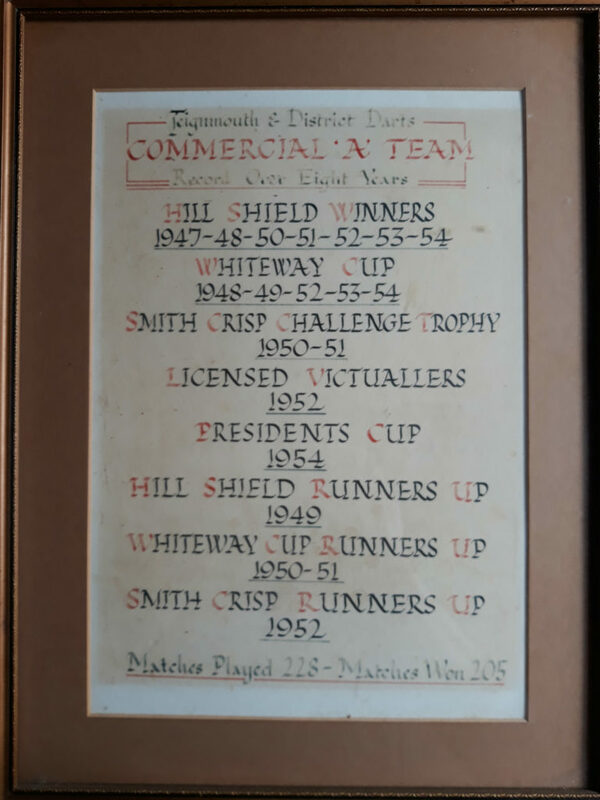 We have some beautiful trophies and other ephemera which give details of past matches and team members achievements. 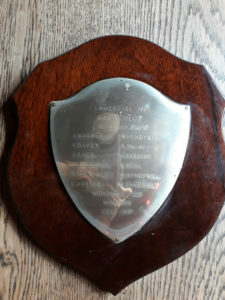 One name that recurrs on the trophies is Fred Honeywill, an accomplished player. 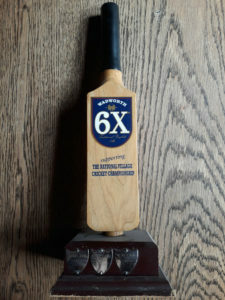 At the time of writing Fred is still an active member of the pub team. 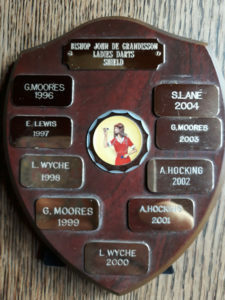 Currently the pub has a mixed team but there was once an active Ladies team. 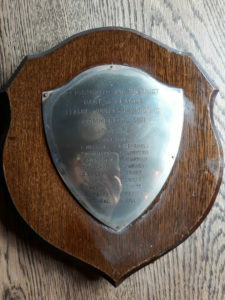 The pub also houses a cricket trophy from The National Village Cricket Championships. 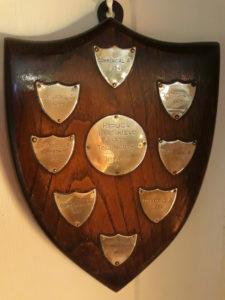 Tug ‘o War has also featured in the pub’s sports fixtures. 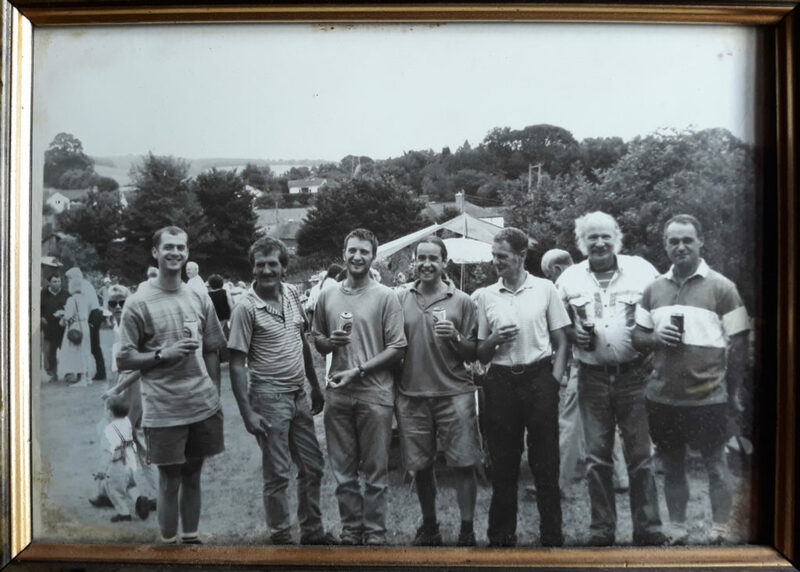 This photograph shows the pub team at the 1996 Ideford Fete. Named (left to right) are Nick Coleman, Vic Simmons, Paul, Steve Bowden, Gus (Mike Harris), Jim, Phil Johns. 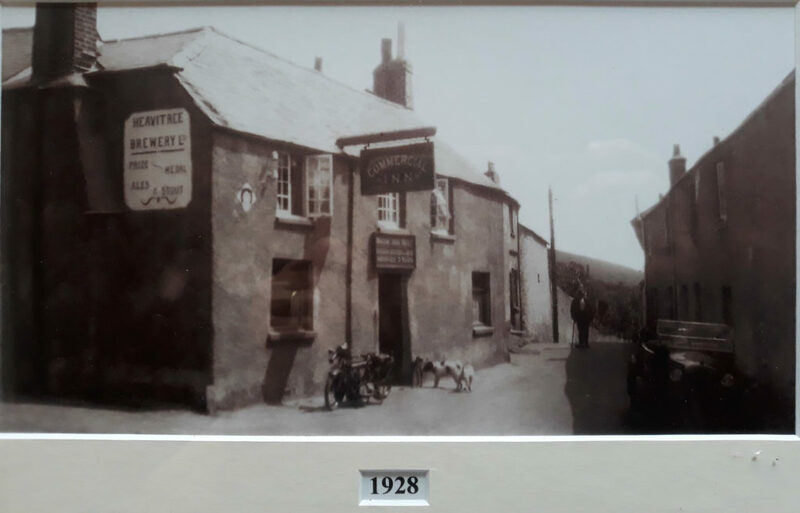 Mr Graham Crocker, Managing Director of The Heavitree Brewery Plc kindly supplied some of the tenancy information in his letter of 15th January 2019, along with copies of some photographs.